Rabbi Mel Gottlieb, PhD, is President of the Academy for Jewish Religion, California, and the Dean of its Rabbinical and Chaplaincy programs. He teaches a variety of courses including Kabbala, Hassidic Commentaries, Spiritual Dimensions of Biblical Texts, the Wisdom of the Zohar, Rav Kook, and the Mussar Psychoethical Masters. This article appears in issue 8 of Conversations, the journal of the Institute for Jewish Ideas and Ideals. Among the essential questions that most religions and cultural traditions attempt to address are how to explain the mystery of our origins, and what gives our life meaning. The word religion is related to the Latin verb “ligare” (to bind or yoke), to connect oneself to the divine and attain wholeness in the process. What tasks must we undertake to fulfill this mandate to attain wholeness and bind ourselves to God, and how do we come to grips with that which bites us? The Hafetz Hayyim, in his work Ahavat Hessed, suggests that one of the main purposes of Judaism’s laws is to actualize our capacity for hessed(Olam Hessed Yibaneh, Psalm 89:3) and to imitate God’s ways (Devarim, 11:22; Sifrei, Ekev, Piska49: Shabbat133b). We are given free will to achieve our holy task, and guidance through the laws of the Torah, expression of prayer, and the practice of lovingkindness to strengthen our purpose (Aboda Zara17b). We have the innate capacity and the intrinsic intuition to identify what is the Godly thing to do. We do not always find clarity with the large Mysteries of life, but we are not supposed to in this world according to the Sefat Emet(Vayhi), for this is a world of Emunah(faith that is developed in the face of sporadic absence of clarity) rather than a world of Emet. Olam Ha’emetis the term for the next world; here our growth stems from a movement toward truth, and our contributions to the world are enlarged in this process of struggle (Ramban, Bereishith22:2). Our trial is that we are to achieve this growth, this actualization of the image of God, while at the same time grappling with drives that may also remove us from our mandate. Those of us seeking to live lives filled with hessedmust face those drives that threaten to remove us from our mandate to live as ethically as possible, and in fact to go even further, to make these drives vehicles through which to discover the Holy. The enticements of the modern world feed the hunger of the evil inclination, especially when our ability to discern meaning is clouded by a lack of learning Torah with depth, and we are given facile answers to challenging questions, answers that do not satisfy the discerning intellect. While the study of Torah in a pre-modern environment, within a community that had common values and goals was sufficient to hold an individual to continue within communal norms, the openness to alternative explanations of reality, the temptations that fulfill the body, and the forces of evil that have overcome perceptions of God’s justice in the universe have led many of our young people to leave the path of Torah. They are sometimes attracted by other spiritual paths that attempt to address their soul’s yearning, and they no longer seek meaning within the Jewish path. Examples of lack of proper ethical behavior by some Jewish leaders have also left them with troubling questions. There is one very rich psycho-spiritual-ethical movement from our tradition that can be employed as a powerful tool to help promote wholeness and help us to reach our goal of becoming evolved ethical beings, and humans capable of acts of hessed. 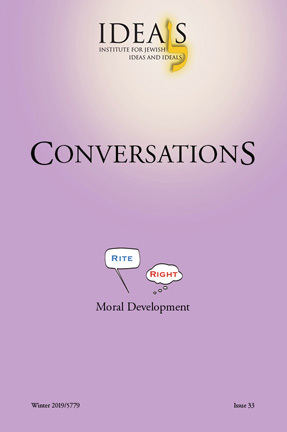 It has the capacity to address the ethical dilemmas that each of us confronts within our own human struggles, to set out a path where we can improve in the face of trials to ethical behavior, and to attract others who are looking for a means to help them come to grips with their instincts as they begin the spiritual path. Just as in the Torah, where we learn from the story of “The Copper Serpent” (Bemidbar21:4–10), that that which bites you can also heal you if you face it, engage with it, trace it to its root and come to know it, this movement affirms that only by acknowledging the power of the instinct, and identifying its origin and evolution can the journey with the instincts be a means to bring one closer to God. This movement is Mussar. The Mussar movement arose in the nineteenth century, most centrally influenced by R. Israel Wolf Lipkin, known as Reb Yisrael Salanter (1810–1883), in a period impacted by the Enlightenment and what Reb Yisrael perceived as a lack of spiritual/ethical depth in parts of the Jewish community including the yeshivot. Reb Yisrael derived his central teachings from the Torah, Proverbs (Mishlei), Saadya Gaon’s Emunot V’Deotfrom the tenth century, Ibn Pakuda’s Hovot Halevavotfrom the eleventh Century, and the Ramhal’s Mesilat Yesharimfrom the eighteenth century. Reb Yisrael was bothered by the phenomenon of Jews being outwardly observant of ritual commandments while at the same time neglecting social and interpersonal commandments. For example, he noticed that fellow Jews were very concerned about discovering a drop of blood in an egg (which would deem it non-kosher), but not as concerned with the blood that rises in the face of someone who has just been hurt by the evil tongue. He wanted one to become aware of inner structure as the judge of a religious act; if one did not become more aware one would end up living a life based on habit, diversion, and conformity. What has often passed for religion is this habituation pattern (making of religion a mere plethora of obsessive details to gain control over anxiety); so- called reason can also be just a rationalization of instincts and fears (for example, the male fear of giving up power and control of the synagogue can lead to the halakhic claim that women are only permitted to take on proscribed roles). In Reb Yisrael’s eyes, religion had become a hergel,a cultural “habit,” where people came together to join a community which supported a specific lifestyle, but did not sufficiently confront their behavior, inner motivations, and elevate their religious practices as a means toward connecting to God. He tried to understand this phenomenon and came to the conclusion that human beings are more powerfully influenced by deep emotional forces than simple rational motivations. Unless these emotional forces are addressed, they will always undermine our rational proclivities. He called these forces keihah,the dim or dark part of the psyche, as opposed to the less potent meir,bright, clear part of the psyche (Ohr Yisrael, p. 25). The dim part of the psyche could become ruled by the bright part, but only with consistent work, combining intellect and emotion. According to Reb Yisrael, one must become acquainted with the totality of one’s inner patterns in order to become the very one that one’s destiny calls one to, the ethical, spiritual being that the Torah requires. As Reb Yisrael put it, “The Torah came to create a mensch,” the more human you are, the more Godly you are, the more Jewish you are. But this is possible only when one can gain some insight into the “keihah” as well as the “meir” part of one’s psyche. His ideal was for every human being to be conscious of the “opposites” and thus capable of utilizing every character trait and its opposite (Kol middah v’hipukho, Ohr Yisrael, p. 42), so that he can express the most appropriate response in every situation. One has to be capable of experiencing pride within, in order to recognize the need to honor others and bestow this appropriately upon another, but one must also be capable of humility (perishut) in order not to overly demand recognition from others (p. 42). As a classically trained rabbi and also a depth psychologist, I have come to realize that this insight is similar to Freud’s notion of the unconscious (dark, inaccessible) and conscious (more accessible) forces that make up our psyche (SE, XXII. 73). Jung also discovered that we are filled with opposites, a veritable complexio oppositorium, and only with this awareness can we reach the greatest consciousness and depth. The goal is not to repress one side of the opposites but to recognize the “opposite” so the repressed drive does not control us. Examining the drive through recognition is the only way to transform its energy to a positive direction, and understand its “root,” its motivating purpose to reduce stress (pleasure principle). In reality the pleasure principle does not reduce stress, but creates additional stress because of future consequences (for example, expressing harsh anger toward another creates an enemy who will spread evil gossip in the future about you). So understanding what Freud called the “reality principle” and what Reb Yisrael called “hokhmat olam” leads to more fruitful behavior. As the Talmud says, “Who is wise? He who can see the consequences of his actions” (Tamid32a). Reb Yisrael brought the example of Moshe Rabbeinu as one who epitomizes the capacity to experience all the middot, and thus become the most open and empathetic of all human beings. (“ve-haIsh Moshe anav me’od mikol adam,” Bemidbar, 12:3). The Midrash points out that Moshe experienced everything of which one is capable. He is abandoned as a child, yet is raised in the house of the Pharaoh. He lives in an urban environment in Egypt, and in a rural environment in the desert. He goes off on a spiritual journey to find the burning bush, and comes back to share this knowledge with his people. We even find Moshe as a murderer of an Egyptian in the Torah. Yes, Moshe experiences everything, so he can empathize with everyone. He knows the narrow line between self-control and anger, between restraint and impulsivity; and therefore he can probably empathize even with a murderer. Moshe also had an awareness of his inner complexity. The Midrash relates a story that Pharaoh had suspicion that Moshe may be the redeemer of the Hebrew people, since he was very intelligent, and there was a rumor among the Israelites of an impending redemption. So Pharaoh asked his astrologers and phrenologists to do a personality check of Moshe. They came back in a few weeks and said, “No way can it be Moshe. Moshe is by nature gluttonous, depressive, licentious, slothful, etc.” And the rabbis state that this was indeed true, the greatness of Moshe was that he became Moshe in spite of these inner tendencies; and it was the awareness of these tendencies that made him so open and empathetic to others (Shemoth Rabbah, no. 1). The Mussar methodology as developed by Reb Yisrael focused on the removal of those impediments that inhibit spiritual connection, and helped students and practitioners to face their fears and to move forward with them. The methods employed by the Mussar movement begin with Reb Yisrael’s personal example found in the many stories of his ethical behavior. One such story is as follows: Once his students observed that RebYisrael only used the minimal amount of water to wash his hands (only to his knuckles) before the meal. They asked him about this since it was considered virtuous to use the maximum amount of water (to the wrist). Reb Yisrael replied, “True, but not at the expense of the water carrier having to carry a heavier load of water” (Gottlieb, “R. Yisrael Salanter and Therapeutic Values,” Tradition,Vol. 15). For practice, he gathered a group (“va’ad”) of students and had them focus on a particular character trait and work on it for several weeks at a time (heshbon haNefesh). They were to engage in introspective meditation (hitbonenut) while focusing on the trait. These traits include humility, patience, gratitude, compassion, order, equanimity, honor, simplicity, enthusiasm, silence, generosity, truth, moderation, loving-kindness, responsibility, trust, faith, fear of Heaven, decisiveness, diligence, and calmness. The students were asked to meet and discuss the trait with their peers, reporting their progress and listening to the feedback of the group members. They were to keep journals in which they were to record at night their encounter with the trait (middah), and in the process they might notice other traits that seemed to emerge as well. They were to arise with enthusiasm in the morning and recite a verse from Scripture which reminded them of the trait so that they would begin their focus right from awakening (hitorerut). For example, if they were working on Equanimity, they might recite the verse from Tehillim, “shiviti Hashem leNegdi tamid” as they awaken. Reb Yisrael also started a “Mussar shtiebel”where a Mussar master would give a Mussar schmooze, usually between Minha and Arbith, devoted to the theme that they were studying. It was a talk taken from a lesson in Torah, but with the intent of reaching the heart and rousing emotion. Many times a verse was repeated over and over in a sing-song to break through defenses (hitpa’alut). Often the themes emphasized the imagining the experience of living from the soul and the rewards of the Light. Courage and not despair, and the possibility of repentance was emphasized, for it was suggested that anyone could “reach the level of Moshe Rabbeinu.” They also engaged in intense communal prayer that impacted each of the participants, Mussar Torah interpretations that focused on inwardness, and analysis of mitzvoth and tales from a psycho/spiritual point of view. Reb Yisrael’s astute observational skills led him to discover another deleterious behavioral pattern that originated from a lack of consciousness. He observed that when one sees imperfections in others, instead of looking into the source of these imperfections within, he creates an imbalanced, judgmental vessel under the guise of ethics. As Reb Yisrael said, “Rather than worrying about another person’s spiritual level and one’s own physical needs, one should worry about another person’s physical needs and one’s own spiritual level” (Gottlieb). So, for Reb Yisrael, a system of compassionate ethics could only be achieved if one is aware of one’s own unconscious forces that one tends to repress and deny because of discomfort with this knowledge and the shame that it brings. One prefers blindness at times to these deep inner forces, and chooses to operate on a restricted “rational” level to avoid discomfort. But this can lead to disastrous ethical consequences, especially when it is supported by a communal stance that seeks comfort, rather than self-confrontation and growth. Reb Yisrael was confident that even though the “dim” forces were strong, one’s desire to grow, and the soul’s need to find meaning and growth (even though it was painful) was a strong asset and thus the soul’s quest would succeed with the aid of proper tools, strong effort and the aid of God. Though a human being is free in fantasy, but limited in reality (Iggeret haMussar, p. 1), though one is forced to yield to life’s limits and ultimately to tragic death, the attenuation of imagination can lead to a life of accomplishment and actualization. (In psychological terms, the reality principle would triumph over the pleasure principle). One only had to be awakened to inner motivations that led one to flee from death and vulnerability, escape into habit and diversion, and make religion itself into another regressive habit. Moreover, Reb Yisrael asserted, if one did not find greater consciousness, even the adjudication of halakhic decisions would be fraught with unconscious agendas rather than with true objectivity. God would be worshipped in the wrong spirit, emphasizing rites and rituals, but lacking greater interest in social and interpersonal conduct—and this would cause a great hilul hashem, turning people away from Judaism. Why is this important to articulate? Because so many of our young people are attracted to other religions and movements such as Hinduism, Buddhism, Humanism, and secularism because they do not realize that we have authentically Jewish spiritual approaches within Judaism. Though there have been many sages who have objected to the need for Mussar in the past, and posited that Torah study itself is sufficient to perfect the personality, our modern experience has revealed that at this time we need more, a specific attempt to refine the middot, so as not to create further hilulei hashemin the world, and so that an Am Kadoshbecomes strengthened. Our sages teach that Torah without consciousness does not always lead to a successful outcome. As R. Hanina Ben Dosa said: “Anyone whose awareness of sin precedes his learning, his wisdom will endure, but anyone whose wisdom takes priority over his fear of sin, his wisdom will not endure” (Avot3:11). As Reb Yisrael Salanter insightfully pointed out, certain character traits are universal and can only be overcome with consciousness and practice. As he said, “A poor person with a piece of bread can be as gluttonous as a rich person with a feast” (Gottlieb, p. 127 ). Thus he created this unique methodology to develop consciousness and ethical deportment. R. Yisrael believed that by engaging in conscious practices and reinforcing them, and through sublimation and becoming aware of and understanding the unconscious, change could come about. Reason must be the powerful tool to help achieve this, but reason alone was not powerful enough to prevail over instincts. Change comes about when rational insights are brought down to the emotional level. This is difficult because a human being is fundamentally irrational, so one must work hard on it. Reason had to be combined with strong emotional passion in order to create a strong enough energy to overcome resistance and habit, and it had to be reinforced through action. Reb Yisrael said, “Our impulses are swiftly running currents which drown our intelligence if the latter is not carried over them in the boat of emotion and enthusiasm.” Thus the Mussar shtiebelis so important. And this desire must be translated into and reinforced by action. One interesting school of Mussar, the Slobodka School, has particular contemporary relevance. In the Slobodka School, the spirituality of man, his unique potential was offered through parables of our ancestors. It was taught that the physical was also holy, and the strategy was an appeal to greatness, to imitate God’s ways in order to know God, to be loving just as God is loving, and this is what manifests God’s presence in the world. It was taught that to serve man is to serve God; kindness affects the doer too; and happiness is achieved through the mitzvoth. Another practice was daily meditation and self-analysis of one’s relation to the trait (hitbonenut), attempting to get to the habits that prevented successful mastery of the trait; patterns that had been erected to escape confronting anxieties and perceptions of inadequacies. These patterns inhibited one’s progress and took great effort to unravel. They committed themselves to transform a life based on ego values, in order to live a life from the soul, in order to become a mentsch, an ethical ba’al middot. In the Navardok School, students were asked to engage in practices that would break attachments (shevirat haMiddot) to traits that inhibited growth. For example, if they were working on humility, they may have been asked to go down to the train station in disguises and carry the luggage for passengers in need. These actions reinforced the progress that they made in their contemplative mode. Furthermore, they all studied the halakhot related to the trait so that their consciousness was aroused to concentrate on keeping vigilant in practice, and this would lead to transformation in behavior. When they studied they were also asked to do so aloud, repeating the meaningful passages so they would make an imprint on their heart. They were also asked to study Hoshen Mishpat(social laws) and hokhmat olam(practical wisdom, or what we now call human psychology). Finally, they contemplated the results of their actions, and developed new habits through practical action and reinforcement. How can the essential insights and teachings of the Mussar movement and its methodologies to improve character be implemented in a modern context? There are already many examples of yeshivot, schools, synagogues, and the Mussar Institute under the guidance of Alan Morinis that are utilizing its methodology to inspire adherents to its philosophy. Sensitive people who are attracted to Mussar seek not only their own personal spiritual growth, but also a system that leads to a mature faith, and an enlightened perspective on religion. At the Academy for Jewish Religion California, I have instituted a Mussar program as part of the curriculum to train professional clergy leaders. All students studying at the Academy are required to attend a Mussar group for three years during their study. They are placed with a group of six to eight students and must attend the group for one hour each week. Students must also keep a journal and on a daily basis insert thoughts related to their experience with the trait that they are working on. Each week they also listen to a “Mussar schmuess” related to the parashaof the week. Reading material includes an article that I wrote in Traditionsome years ago that summarizes the highlights and goals of the movement, as well as Everyday Holinessby Alan Morinis and Luzatto’s Path of the Just. The group leader is a fellow student who has demonstrated leadership capacity, and who has taken a course on Mussar and also received some training with me. After every Mussar group session, which takes place on a Sunday evening, I meet with the group leaders (as their supervisor) for an hour to review their meeting with their groups. There we work together to address challenges that have arisen through supportive suggestions, and review progress or outcomes the following week. Every two weeks, a specific character trait is chosen and sent out to all the students. It contains an assignment to read a specific chapter on the middah, and the students must work on that middahfor two weeks. When each trait is chosen, I also send out a message elaborating its specific qualities, its challenges, and some typical patterns that are associated with it. I will illustrate below with two examples of such communications to the students. For the next two weeks, we will be working on the character trait Patience. Patience can be defined as the ability to wait calmly for something to happen without complaining or giving up. Patience emphasizes calmness, self-control, and the willingness or ability to tolerate delay. Impatience is often linked to a thought stance in life where we are used to getting things instantly, and with the illusion that we have control over these things, and that we have the right to expect that which our will desires. It is linked to a philosophy where individualism/egoism is emphasized, and where we expect to succeed based on our own power (efforts). There are cultures where individuals connect more to a group consciousness where one sees oneself as part of the whole, connected to many structures that operate at the same time, and one’s expectation is just to fulfill a specific task within the whole. We do not have to stand out as heroic; we just have to fulfill the duty in front of us. The success of a complex task does not rest solely upon us, our honest efforts are demanded, but the results are not in our power. Failure, thus, does not lead to self-blame but it is often the result of circumstances beyond our control and there is often a lesson to be learned from this so-called “failure” (mistake). The Heavenly realm instructs through both “failure,” and success. This way of thinking leads to greater simplicity, and greater patience. As the Heshbon Hanefesh states, “The impatient person feels his affliction and pain more intensely than others. Moreover, he is also beset with vain regret, filled with meaningless remorse, making statements like: “Had I only not entered that business, this would never have occurred. Had I only stayed in that place for another hour, I would not have ended up here.” This way of thinking is a result of an inflation of our power in this world. The antidote to impatience is humility: knowing what we have the power and responsibility to change and knowing where to leave space for others, and for the patient way of the universe. It is humbling and painful to realize that there are many things in the universe that are uncertain and that do not agree with our ego’s wishes. But when we “endure” this fact, we can move to a much more truthful awareness of how the relationship between our ego and soul needs to shift for a more wholesome, spiritual way of living; a more patient, less angry vessel is developed, our ego’s agenda has been revealed and we can see it as separate from our soul’s path. Our ego can now be utilized to actualize our soul’s agenda. So waiting, which was once an excruciating experience for our impatient ego, now becomes a yielding to the timing of the universe and not our timetable. We are no longer in the painful state of “wasting time” because it is not adhering to our ego’s definition of when things should occur. We see that our timetable is an extension of our ego, but in order to gain greater balance we must learn to yield to the limits and timetable of the Universe, the Holy Shekhinah. The next theme for our spiritual development groups is the theme of Order. The reading is to be found in Alan Morinis’ book Everyday Holinesson pages 87–97. This theme is certainly relevant to each of us, who live in a world with a plethora of responsibilities that can be at times overwhelming. We must learn to prioritize, to sacrifice, to yield to limits, so that a sense of order emerges that promotes our spiritual journey and goals. Inevitably, in this process, when we pay heightened attention, we may unmask values that are in conflict, and that prevent us from clearing out distractions and additions, that when removed would allow us to pursue a more “orderly” life. We might discover that our attachments to material pursuits and pleasures take up more time than we would want them to if we are to achieve our spiritual goals. Then we face the question as to why it is so difficult to remove some of these extraneous habits, what role do they fulfill in our lives. Can applying heightened consciousness to their lack of value from a spiritual perspective, allow us to remove ourselves from them, and spend more fruitful time in areas that are more in synch with our “calling”? Can we now see that these time-consuming distractions are actually “habits” that have taken on a “life of their own,” and that we must thus make a conscious effort to “liberate” ourselves from them? Sometimes these habits are merely symptoms that are utilized to fill our hungers for meaning, and our search for meaning must come back to the more fundamental teachings and values in our tradition. Once you begin to work on “Order” these next two weeks, many interesting layers of character traits and habits will rear their heads, and you will be blessed with a greater awareness of the complexity of your inner life. This awareness will become the first blessed step, enabling you to achieve the eventual goal of becoming more orderly and thus achieving magnificent spiritual growth, with noble effort, slowly but surely. If you begin this task, Hashem will bless your efforts and the universe will come to your aid, because a new energy will emerge from your vessel, an energy that will attract support and strength. So for the next two weeks please write journal entries related to your experience with order/disorder and see what emerges for you. Discuss it in your groups, and when you wake up in the morning ask Hashem to help you find order in your life. “Ma norah ma’asekha,” How magnificent are Your works O Lord! May you be strengthened in your work! Students have made wonderful progress in improving their character traits and their growth as future spiritual and community leaders. The Mussar model can be a vital way of life to elevate the ethical level of our religious communities, and can be implemented quite easily by those current religious leaders who wish to avail themselves of this tradition.